With a quite long delay of its release, Popcap finally released its ultimate defense game, featured with its title "It's About Time". 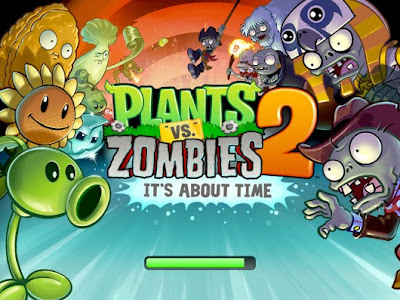 Plants VS Zombies 2 will be available first on iOS for iPhone 4, iPhone 5, iPod touch (4th generation), iPod touch (5th generation), iPad 2 Wi-Fi, iPad 2 Wi-Fi + 3G, iPad (3rd generation), iPad Wi-Fi + 4G, iPad (4th generation), iPad Wi-Fi + Cellular (4th generation), iPad mini and iPad mini Wi-Fi + Cellular. Requires iOS 5.1 or later. You can enjoy the whole game feature and improvements on iPhone 5. While the release for Android OS is yet to announce. The game will feature new environment, new plants, and of course new zombies. These new challenges includes Pyramid of Doom, Pirate's Booty and the Big Bad Butte. 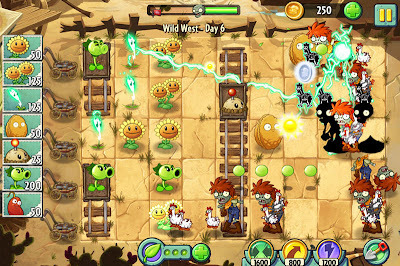 As you've seen in the screenshot, a new zombie called 'Chicken Zombie" (Just figure it out what it does :P). Plants VS Zombies 2 has also been change to its new and smooth interface. All in all, PVZ2 is a game for you and for everyone. Enjoy new adventures, new challenges, new features, and new ways to eat your brain.